I'm trying to find a through-line to describe the three shows that open this weekend on area stages -- Archibald MacLeish's J.B., the good old Rodgers and Hammerstein musical Oklahoma! and Stephen Karam's Sons of the Prophet -- but those are some pretty disparate shows. Although Oklahoma! was written and performed first among the three, it's J.B. that looks back the farthest for its literary material. 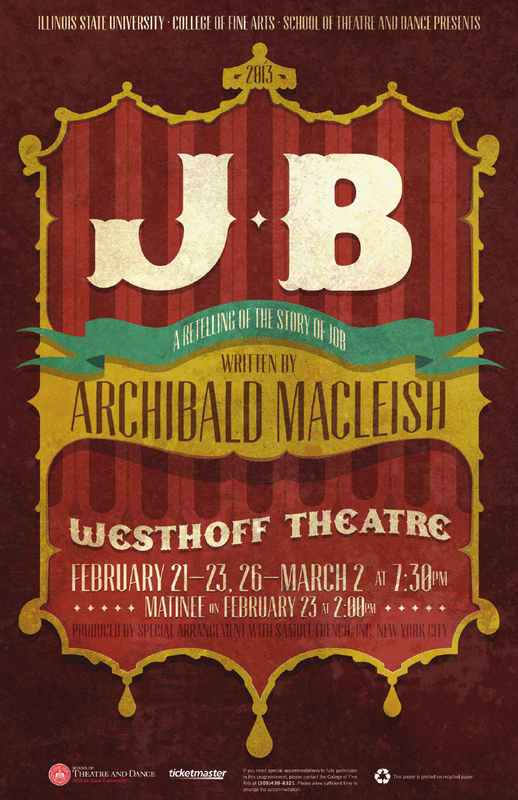 Stick an O between that J and B, and you'll see where MacLeish's play comes from. And that would be the Book of Job in the Bible. You will probably remember Job as a very put-upon guy, one whose faith is tested by God in a sort of celestial bet with Satan, whereby Satan takes away Job's children, his wealth and his physical health to see if he can get Job to turn his back on God. Job is mightily tested, but he remains strong in his faith. So that's your happily ever after. I don't find it all that happy myself or a terribly good reason to have faith, but... I am guessing I am not the intended audience. I may be closer to MacLeish's intended audience, however, since his version of Job, which sets the action inside a circus tent, has a somewhat different ending. 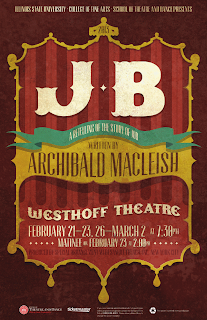 Archibald MacLeish's J.B. opens on February 21 at ISU's Westhoff Theatre. And, yes, it will be circusey. Matthew Scott Campbell directs this production, with Tommy Malouf as Job, and Andrew Rogalny, Jr. and Matthew Hallahan as the competing forces of good and evil. 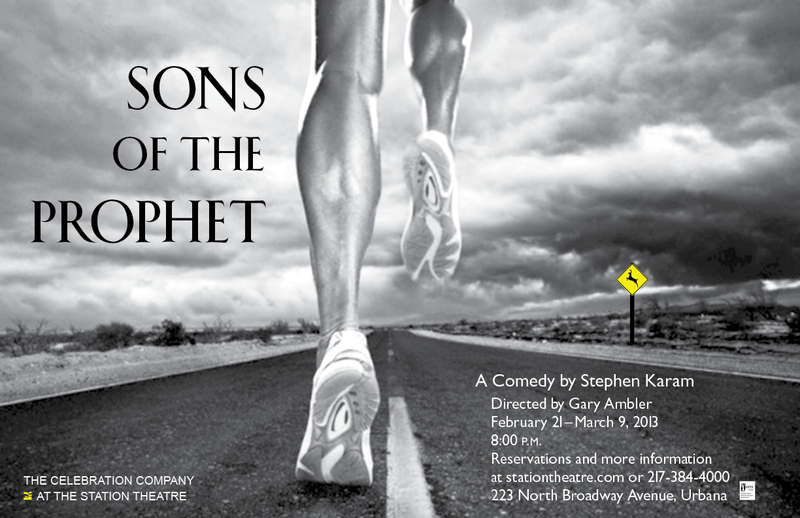 Sons of the Prophet, a new play by up-and-comer Stephen Karam, also opens on the 21st. This one is directed by Gary Ambler for Urbana's Station Theatre, with Joel Higgins and David Mor as the sons in the title. Their prophet is not anyone Biblical, however, but instead Kahlil Gibran, who wrote the famous book of poetry called The Prophet. Family legend says that Joseph and Charlie Douaihy are indirectly related to Gibran, and that fact is Joseph's toe in the door to get a book of his own published. But hard luck follows the Douaihy family, not unlike what happens to Job up there. As Karam examines "how people endure the unendurable" through the tragedy and joy in one Lebanese-American family, Sons of the Prophet finds the humor and compassion in humanity. And then there's Oklahoma! Based on a 1931 play called Green Grow the Lilacs, written by Lynn Riggs, Oklahoma! is a musical exploration of cowboys and farmers, American expansion west, romance down on the farm, girls who cain't say no, all boosted by the classic Rodgers and Hammerstein score and the exuberant choreography of Agnes de Mille. The poster for ISU's production, which is directed by Richard Corley, looks like he's bringing in some jump, jive and wail to pull the show forward from its 1906 setting to something that more approximates the time period of the original Broadway production, which premiered in 1943. Those definitely look like jitterbuggers over there on top of the state. On the other hand, the cowboy seems to riding a John Deere and I don't know that riding lawn mowers were hanging around in 1943. But it would certainly seem to indicate that this will be a more modern Oklahoma! than most. 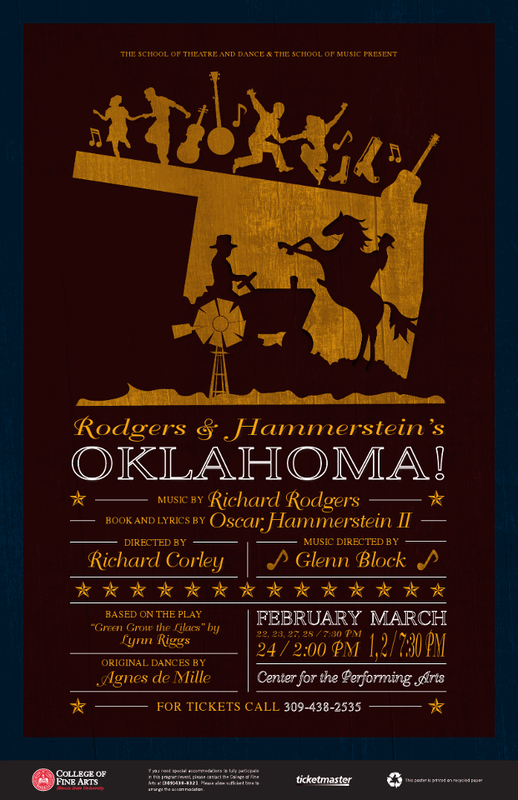 Whether it's extra jazzy or original recipe Oklahoma!, the show will open February 22 at the Illinois State University Center for the Performing Arts. For tickets or more information, check out the event's Facebook page here.